View More In Wheel Care. Regardless of how clean you think your wheels are, there are still contaminants stuck on the surface that eventually bore their way through the finish. Clay leaves behind an ultra-clean, ultra-smooth surface that is ready to receive wax or sealant for protection. 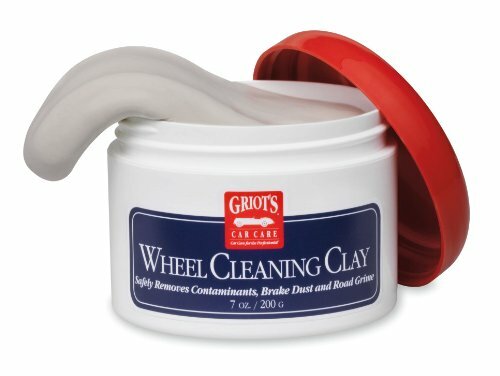 Clay is safe for all wheel finishes. To use, first thoroughly clean your wheels. Remove the clay from the wrapper and tear off a small ball. Next spray your wheel with Speed Shine (it acts as a lubricant allowing the clay to glide over the surface) and rub the clay back and forth until there is no drag. Unlike other cleaners and polishes no buffing or hard circular motions are necessary. Wipe dry with the soft micro fiber cloth. Follow up with Best of Show Wax or paint sealant to protect the finish. The large 7 ounce (200 gram) clay bar will clean many wheels depending upon the amount of contamination on the surface. The results are amazing. If you have any questions about this product by Griot's Garage, contact us by completing and submitting the form below. If you are looking for a specif part number, please include it with your message.